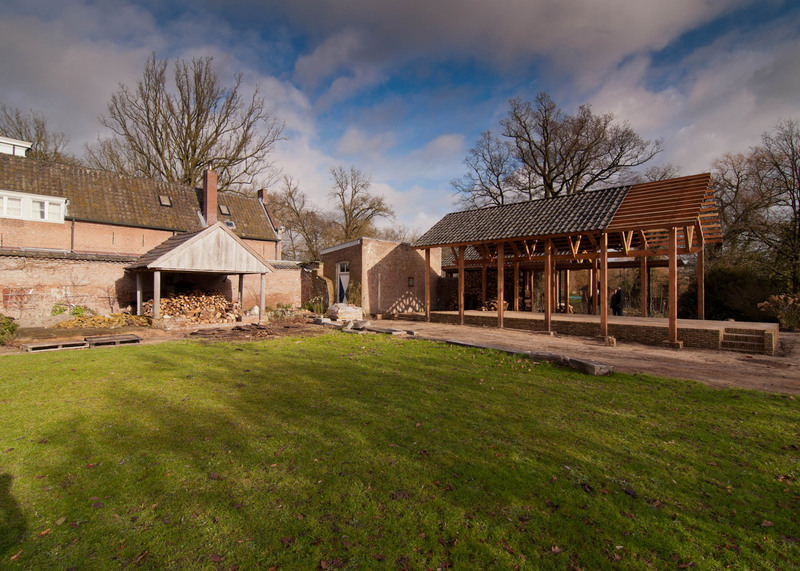 DeBossa Architects designed this timber pavilion to offer residents of a historic house in the Netherlands a sheltered outdoor space with views of the surrounding countryside (+ slideshow). 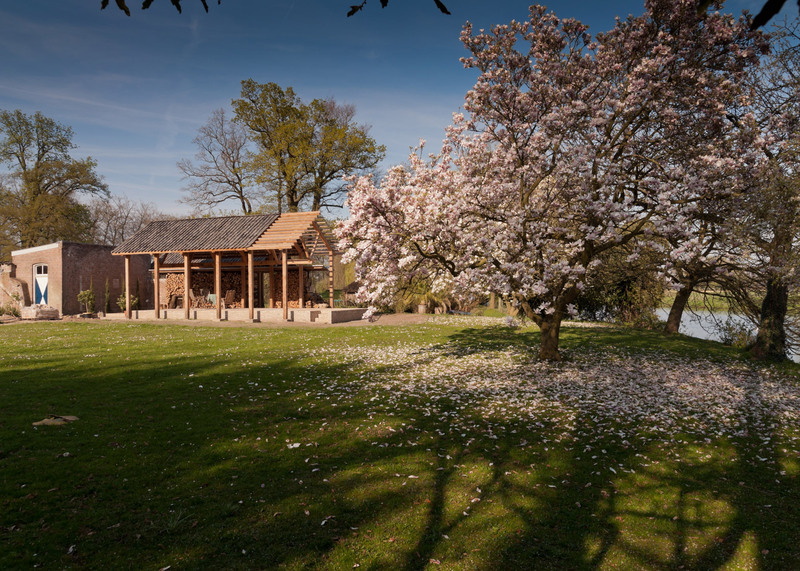 Eindhoven-based DeBossa replaced the outbuildings of Zegenwerp mansion – located on a former isle of the Dommel river – with the pavilion. 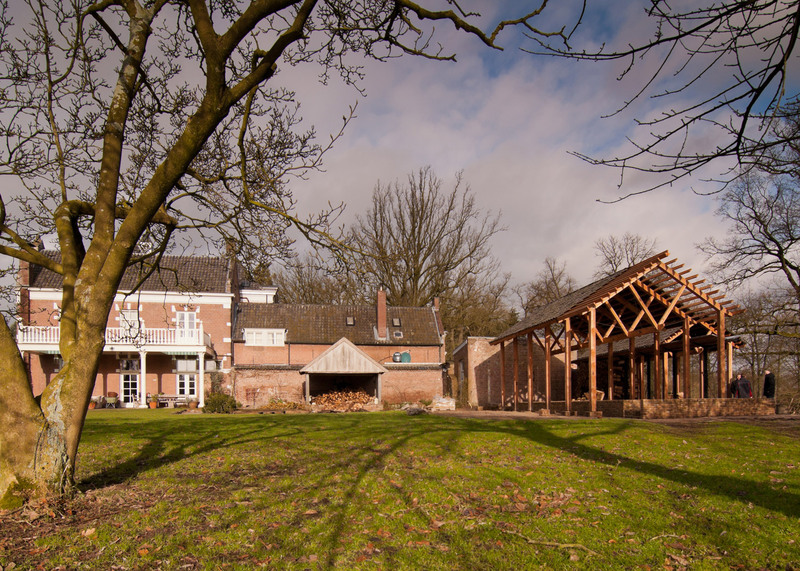 It forms the final stage of a renovation commissioned by Brabants Landschap, the trust that owns the building. "The residents had a wish to add a construction that would enable them to receive guests for outdoor receptions, dinners for up to 20 people as well as occasional musical performances, all enjoying the surrounding landscape while being sheltered from bad weather conditions," architect Joost Pijnenborg told Dezeen. "Additionally they needed a well-ventilated but dry place to store the firewood used to heat the historic mansion." The architects split the pavilion into two parts to separate different uses. A larger socialising space connects by steps to a smaller area for parking a car, storing gardening tools and playing ping-pong. Between the spaces, a 10-metre-long firewood store extends from an original stone wall and forms a partition. "The pavilion consists of two saddle roofs that are slightly different in width, length, height and level," said Pijnenborg. "They are displaced longitudinally and offset evenly from a historical brick wall, that forms the centre of the new composition." The larger area faces out towards the surrounding landscape and river. 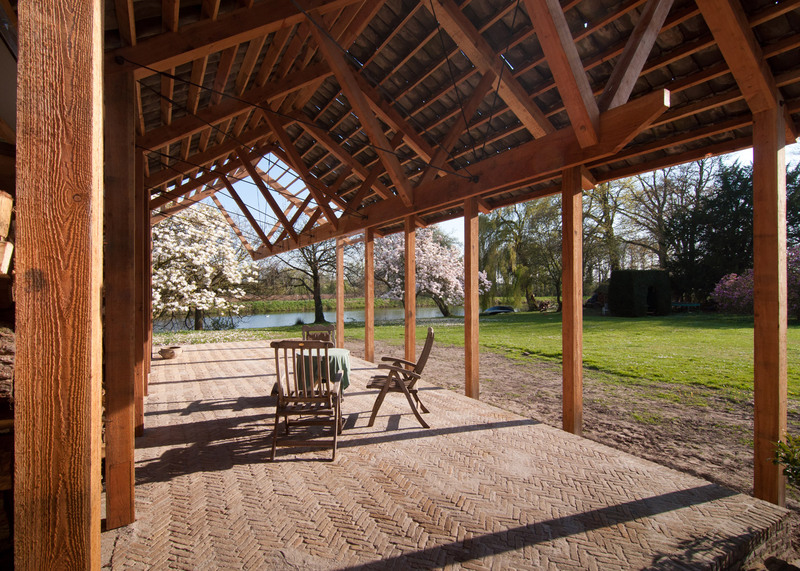 Six timber columns frame the entertainment area, with no horizontal struts in order to maintain views, while 10 columns support the roof in the smaller space. Rather than a traditional truss, the structure is supported by angled beams and steel cables. "A very delicate sense of ceiling occurs, making the rather large structure more intimate." Pijnenborg said. "At the same time, the lowered centre offers a diverging view on the rich surroundings from underneath the canopy." Recovered tiles cover the roofing of both spaces, although the dining area is only partially sheltered. An inverted roof above the firewood storage functions as the gutter for the pavilion. The columns of the store – two T-beams bolted together – are a reference to Mies van der Rohe's Barcelona Pavilion, according to Pijnenborg. "The firewood store has been designed as slender as possible and in a different colour, made up of blackened steel columns with flat arms carrying a folded zinc roof," said the architect. 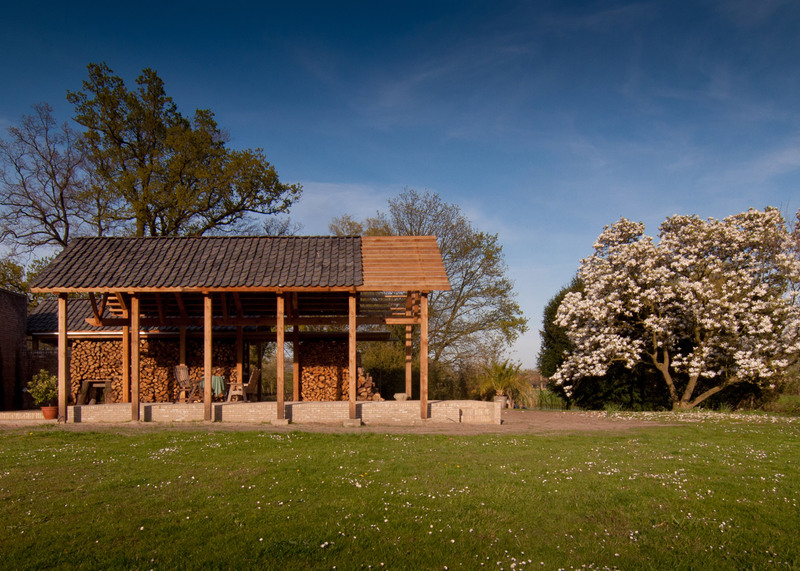 The timber used to build the pavilion were felled from local forests owned and conserved by Brabants Landschap. The yellow bricks laid in the dining area and used for the steps – named IJsselsteentjes in Dutch – were recovered from a demolition site. They match the bricks of existing paving and the foundations of the main building. "Rather than using form or style, we chose to adopt the historical materials as well as the craftsmanship needed to work with them," said Pijnenborg. "The aim was to build a structure that would somehow physically relate to the historical context in a more delicate way than to simply contrast it." 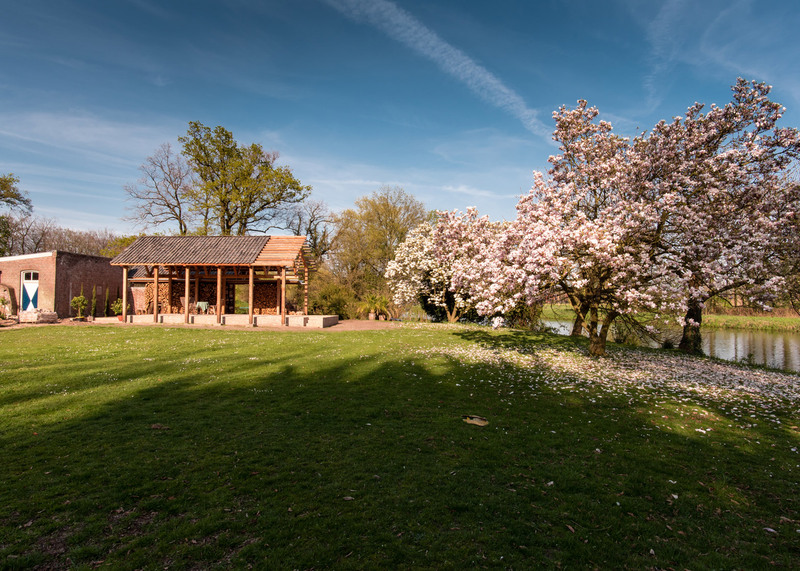 Other recent examples of wooden pavilions include an education centre in Texas by Lake Flato Architects and a temporary events space in the grounds of a Copenhagen castle. Photography is by Thijs Follet and Joost Pijnenborg.